The Micronesia Challenge was built on groundwork laid over the previous decade. With a goal of strengthening conservation in the Pacific, The Nature Conservancy’s Chuck Cook—a highly successful state program director from the US—initiated projects at a handful of sites in the island country of Palau in 1990. Soon he realized this approach was not sufficient or effective. As he pondered what to do next, Noah Idechong, then chief of Palau's Division of Marine Resources, took Chuck fishing and helped him understand that imposing Western models on Pacific islands and people was not going to work. He would get further faster by building on what was there (see The Pacific Way). This wise counsel prompted Chuck to change his approach. 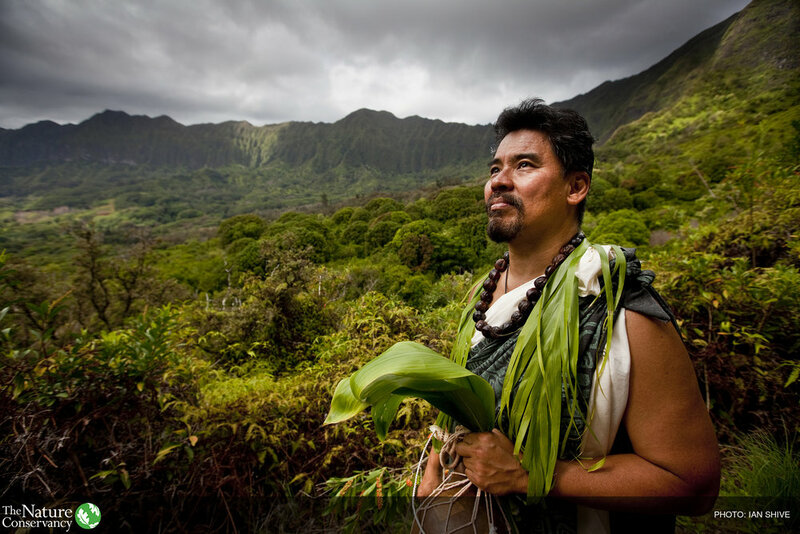 He partnered with Noah and began to actively engage and mobilize Palau leaders and communities in conservation efforts. For example, after extensive consultation with chiefs and villagers, Palau enacted a national law based on the recommendations of fishermen that placed a bul, or traditional closure, on key spawning sites so fish had time to grow and reproduce, and communities set aside and managed marine areas. Chuck and Noah also brought together Palau leaders from the public and private sectors to create the Palau Conservation Society (PCS), the first non-government conservation organization in the country. In Pohnpei, one of four states in the Federated States of Micronesia (FSM), Chuck recruited Bill Raynor to build a community-based watershed conservation program for this diverse forested island. Bill was an American citizen with deep roots and respect in Pohnpei, who had learned the importance of working with communities and culture during a well-meaning U.S. Forest Service project that resulted in him and his team getting chased by angry villagers with machetes. Inspired and coached by the PCS, Bill and Willy Kostka—a promising young Pohnpeian leader—and others created the Conservation Society of Pohnpei (CSP). In embracing The Pacific Way and building a foundation on people and culture, these leaders and their organizations found the way forward and the efforts they pursued quickly gained traction. Understanding that enduring conservation will only succeed if local communities, partner organizations, and government agencies are willing and able to lead, the Conservancy invested in strengthening local leadership and institutional capacity. Initially, this focused on helping catalyze and coach two local conservation organizations, PCS and CSP. Both organizations conducted successful social marketing “Pride Campaigns” in partnership with RARE to build community awareness and support. They also engaged with willing communities to establish or strengthen marine resource management. In just a few years, the success and reputation of both PCS and CSP spread and inspired local conservation groups to form on other island states in the FSM. By 2001, Bill Raynor was the Conservancy’s Micronesia Program Director and seeking an effective way to engage more partners for broader impact across the region. With help from Audrey Newman, Senior Conservation Advisor to the Conservancy’s Asia-Pacific Region, they piloted a new “catalytic capacity-building” model in Micronesia to accelerate and expand conservation using peer leadership networks. In 2002, they launched Micronesians in Island Conservation (MIC), the region’s first peer learning network, founded by respected conservation leaders from government agencies and non-government organizations. Since its establishment, MIC has helped strengthen the skills of more than 30 leaders, whose organizations oversee conservation at 160+ sites across Micronesia. In addition to building their own skills, these network members identified critical institutional and training gaps across the region and together established and helped fund the Micronesia Conservation Trust (MCT). MCT, a non-profit trust fund that provides grants to support biodiversity conservation and related sustainable development, has grown from a small, national trust to an internationally- recognized regional leader in conservation funding. MCT also provides tools and training to strengthen local leaders and institutions, and provides a forum where stakeholders share experiences and best practices to collectively address the challenges of natural resource management across the region. MIC and MCT had a ripple effect across the region, inspiring Micronesia’s island nations to work together to develop a shared vision and national strategies and plans that support conservation and sustainable use of natural resources. Together, they partnered with Hawai‘i and U.S. government agencies to establish the Pacific Islands Managed and Protected Areas Community (PIMPAC), a learning network for staff responsible for leading site-based marine conservation in the field. Micronesian leaders also initiated internships and scholarships that provide intensive mentoring and hands-on experience to help emerging conservation champions acquire the education, skills, and confidence to become effective leaders. The success of these institutions gave their elected chief executives—the Presidents of Palau, FSM, and the Marshall Islands; and the Governors of Guam and the Northern Mariana Islands—the confidence and courage to launch the Micronesia Challenge in 2006—a bold, ambitious, and unprecedented regional commitment to secure the natural resource base that supports their island economies, people, and cultures. Together, these governments oversee an ocean area nearly the size of the continental United States, which helps sustain the livelihoods of 650,000 people spanning 2.5 million square miles. The top-down, high- level nature of the Micronesia Challenge sparked serious concerns and resistance in some areas, but strong partners relationships found a way forward together. Shortly after the Micronesia Challenge was announced, MIC members met to develop clear, shared definitions and measures to collectively track progress on the landmark initiative and to create the Micronesia Challenge Regional Support Team to ensure its success. Over time, the Micronesia Challenge partners collaborated on integrated regional initiatives on invasive species, conservation finance, climate change, and other emerging issues. Palau enacted a visitor “green fee” to generate more than $2 million annually to support enforcement and community conservation areas, and their Micronesia Challenge neighbors are exploring other sustainable funding mechanisms. The Micronesia Challenge is now a standing agenda item at the Micronesia Chief Executives meeting each year, ensuring continuing high-level political support and the opportunity for adaptive management. As a result, the Micronesia Challenge has endured beyond election cycles, with each new President and Governor adopting and adapting this shared regional commitment. These strategic investments in people and institutions have had profound impacts, both within and beyond Micronesia. The pioneering and collaborative approach of the Micronesia Challenge was a cornerstone of the Global Island Partnership, and inspired similar high-level commitments in the Pacific, the Caribbean, the eastern Indian Ocean, the Indo-Pacific’s Coral Triangle, and the European Overseas Territories. In addition, the success of MIC sparked a request from the Secretariat of the Pacific Regional Environment Programme (SPREP) to help launch a peer learning network focused on invasive species. The Pacific Invasives Learning Network was launched in 2006 with six founding multi-agency teams, each representing a different island government, and has grown to include 24 teams across Oceania. Today there is a durable and flexible foundation for locally-led conservation across Micronesia that continues to take on new roles and challenges. Over the years, Micronesia earned a track record for success built on understanding and respect for The Pacific Way. 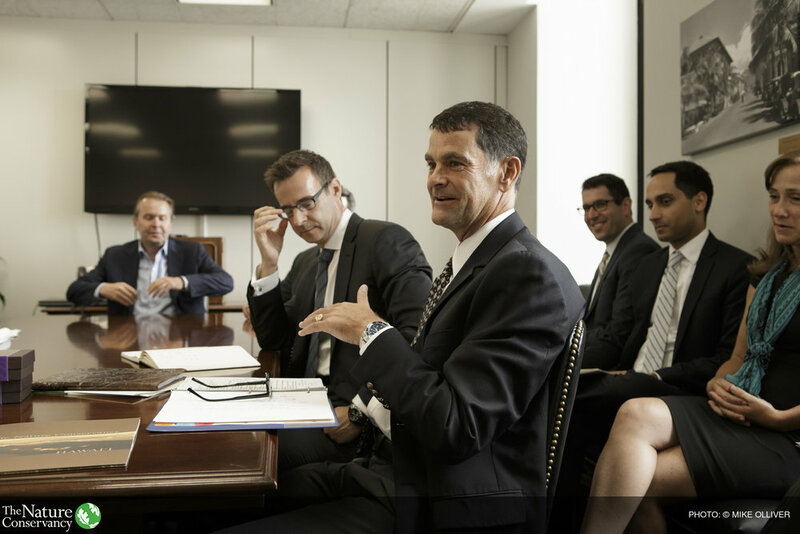 This reputation continues to attract support and partnership opportunities from a growing group of diverse international organizations --, from US foundations, government agencies, and non-profits to major multilateral and bilateral agencies. This previously little-known region is now often asked to pilot innovations and help chart a course for global issues—from climate change adaptation to more sustainable pelagic fisheries—all built on the solid foundation of community-based leadership and collaboration for conservation. To download a pdf of this section, click here.